My cats died. I buried them – head to toe, together – in my rambling garden below the kowhai tree. I don’t garden on their grave. It is a weedy sinking mound – a tribute to what the living cannot control. I met my cats because I fell in love. She sat across from me at dinner – a birthday celebration for the man who would one day marry us on a rocky point off La Jolla, San Diego. I’d been in San Diego for just a few hours. It was foreign and the table of colleagues and future friends new to me. She smiled. I knew a week later I would marry her. I met her cats two weeks later. She lived sandwiched between the edge of a wild canyon and busy street. Coyotes and cars kill cats and cats fight at great veterinary expense. And so she, like many more in North America than New Zealand, kept her cats indoors. They ate indoors and toileted in litter boxes cleaned often. Athena (top) and Pandora (Pandy) at home, inside. 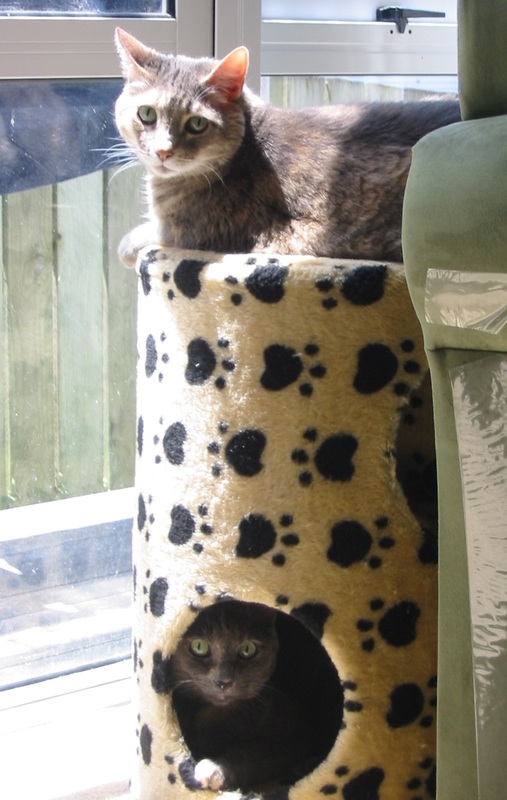 In San Deigo and then New Zealand, they were indoor cats living full, healthy lives. Inside, they were not a threat to native wildlife and cats fighting, predators, and traffic were never a threat to them. Veterinary expenses were rare. We married and left our jobs in San Diego for jobs in Wellington. The cats came too – it was my wife’s only condition on moving. I joked that the relocation expenses provided by my new university went largely to moving my new feline children from California: veterinary bills, air travel, quarantine boarding. In New Zealand the cats remained indoor cats. I believed that cats needed to be outdoors to have quality lives. I was wrong. In our house they roamed, slept, explored, slept, hid, fought, slept and played. They lived full lives. But they grew old. Pandora grew thin, painfully thin. Athena grew slow and reluctant to live well. One day my wife woke up with a conviction held with the same certainty as her determination to bring the cats with her to New Zealand – it was time to die gently. They were too old to live well, too sick to live happily. Three days later and a visit from the veterinarian and they slept to death. I do not have cats anymore but my oldest daughter and wife would like one again sometime. I know this will happen. Do I miss them? Not really. But my wife does. I’d like a dog. I have learned that cats can live indoors. It is better for cats. But next time we have family cats I will build an outdoor mesh-walled enclosure off the lounge so that they can also enjoy an outdoor environment without being free-roaming and we can also keep their litter boxes and food bowls out-of-doors – less mess and smell. So this is my memoir about cats. This is the place they have in my life. I can have a relationship with cats without sacrificing the other important relationship in my life – my relationship with New Zealand’s native and unique biodiversity. I can be true to my different animal relationships without compromising either. To control the cat problem we do not need to pit ‘cat-lovers’ against ‘conservationists. We are the same people and the solutions are not divisive. In response to my previous posts on this debate (beginning here), some have assumed I am a ‘cat-hater’. Oh… if only people, lives and debates were that simple. I have learned to live with cats for the people I love. But I also learned that cats’ impact on our biodiversity can be managed by keeping them indoors. Cats should not be free-roaming in New Zealand. They are a threat to our wildlife. We should keep cats indoors for ours, our wildlife and cats sake.